Bones makes its return this Thursday, April 14. Savor the episodes folks! It has been announced that Bones has been renewed for it's 12th and final season. The 12 episodes will air in the 2016-2017 season. It will bring to a close the storylines of Booth, Bones and the rest of the Jeffersonian-FBI team, giving fans a proper farewell. Picking up after the explosive fall finale, the all-new episode, “The Death in the Defense,” finds Hodgins (TJ Thyne) eight weeks into his rehabilitation and forced to navigate life in a wheelchair. 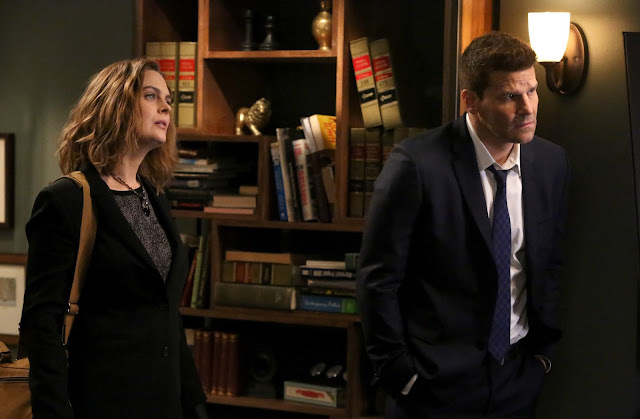 Meanwhile, Brennan and Booth investigate the death of a public defender who had multiple defendants from previous cases with motives to kill her. One of the longest running series on FOX, when Bones ends its run, it will have completed 246 original episodes. Bones airs on FOX Thursdays, at 8 PM ET.